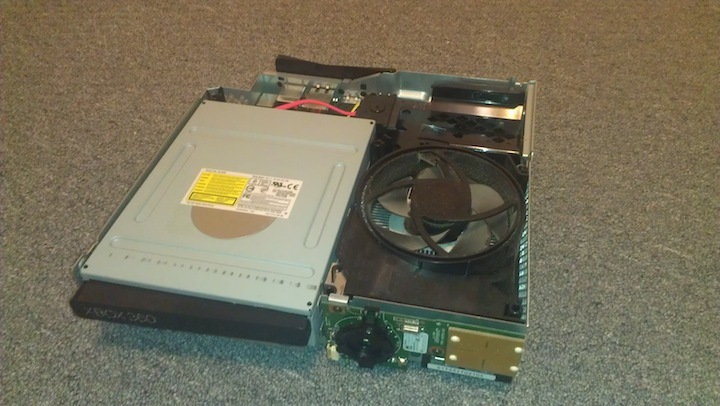 Project SLIM began as an idea well over a year ago... RandomEvilDoer just happened to have a spare, unused, Xbox Slim laying around... and I happened to have none. So began the nearly year long charade of trying to get the thing actually shipped out. But alas, after much wait, hype, and comic relief, it has finally arrived! Phase 1 simply consisted of evaluating the hardware to determine what all would be needed along the way and preparing for the eventual hardware modifications. Great! Being less than 14719 means I can avoid having to deal with a DGX board to obtain the CPU keys. I'll need to update the Dashboard to 14719 later when performing the install. Now, we have our unshelled console. 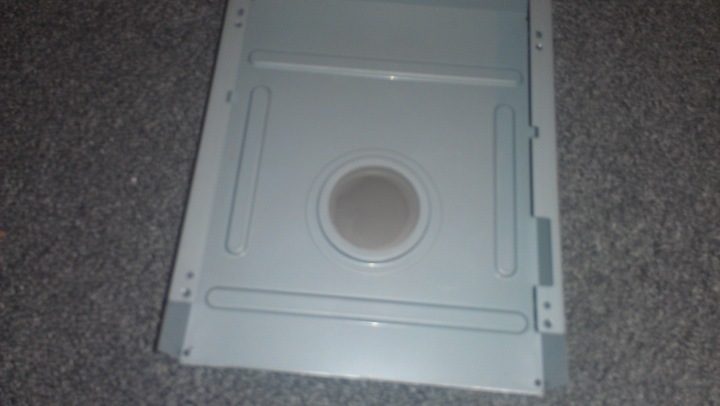 The next step was to disassemble the DVD drive, which was fairly straight forward. However, upon inspection my fears became reality that the drive had been tampered with. You can see here that the firmware sticker is missing. 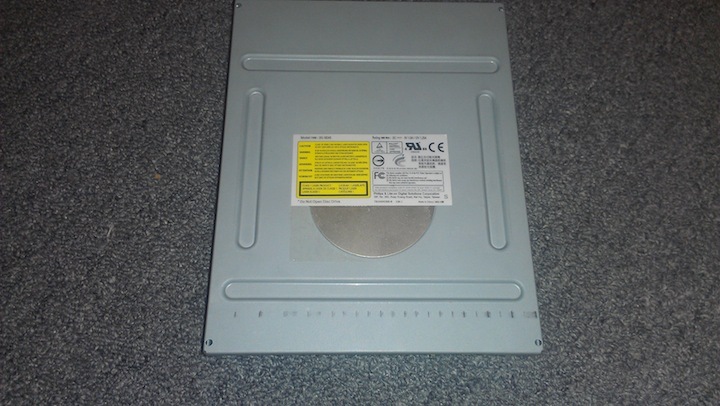 That's not all that is missing, so is the magnetic clamp to keep the disc secured while spinning! No wonder the disc was slipping. I had to track down a cover from ebay to replace the missing spindle! After testing the laser, I discovered it also needed replacing. So, I ordered a G2R2 laser from e-bay for a respectable $6.25, and will be replacing that as soon as parts arrive. Lacking parts, I took the remaining time to analyze the board and inspect all of the hardware mounting and soldering points for both the Coolrunner and DemoN install. Everything looks original and unmolested! Now that all of the equipment arrived I began the initial steps. Most of these don't have pictures, as they are fairly straight forward. Unbox everything, and make sure you have all of your wiring packages, quick solder boards, and everything else that is supposed to come with what you ordered. Using either J-Runner or DemoN Toolbox, make sure you can read the NAND on the DemoN. This is done to make sure everything is operating correctly. Also, use the images included in J-Runner as a guide for wiring and solder points! 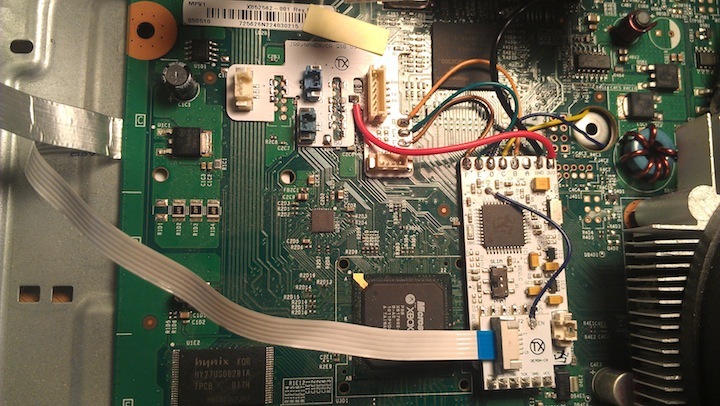 Once the DemoN is installed, plug the power supply into the motherboard, and connect to the Mini-USB port that connects via the ribbon cable to the DemoN (this should light up blue). Dump at least 2 copies of the NAND using J-Runner and verify that the NAND compare function states that the NAND's are the same. 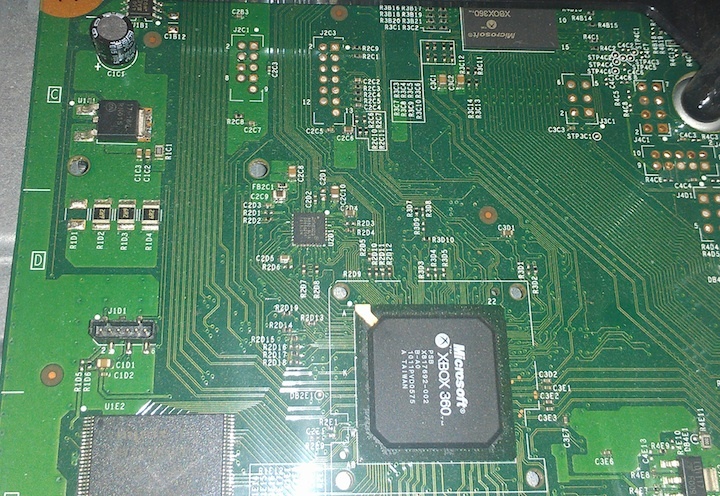 If you are having trouble reading the NAND for any reason, very none of your solder points are shorting and that you are able to toggle between the Xbox 360 and DemoN NAND (Click Demon then TOGGLE NAND in J-Runner). If you get a 'Manufacturer Error FF' it is likely do to bridged solder pads. BACKUP the nanddump1.bin files from the J-Runner output folder! Name these something to the effect of 'Original-NAND.bin' and do not lose these! Always copy and do not move! Install the Coolrunner, be sure to solder a wire from the DemoN add-on board's EN pad to the EN pad on the CoolRunner! Load a COPY of your Original NAND in J-runner and click Create ECC, then switch to the DemoN NAND and click Write ECC. Boot the 360, making sure the blue DemoN led is on, and verify that the Coolrunner debug light (green) flashes at intervals. I find that on my SLIM it would be inconsistent intervals when set to SLIM, but glitches just fine. Wait for it to glitch and for XeLL to boot. You should be all finished! The box should now boot into a patched dashboard. There are number of potential issues along the way that can cause all kinds of grief. If the DemoN is unresponsive, make sure that the switch is set to XBX. Also, verify that you have all of your wires and quick solder points soldered down. They are easy to miss! If this still doesn't work, check with a multimeter for power at the DemoN board. Then check all of your solder points to verify they aren't shorting with any other pads. If you are having trouble reading the nand, you likely have an issue with the QSB points that are all in a row. Other than that, there's little that can mess up or cause problems with the DemoN. Once it is soldered correctly, it pretty much works or doesn't. The CoolRunner can be extremely frustrating. Start by making sure the switch is in the 'NOR' mode. Then, verify the red light comes on whenever power is applied to the unit (usually standby power should turn it on). Next, try to identify if it is attempting to glitch or not. 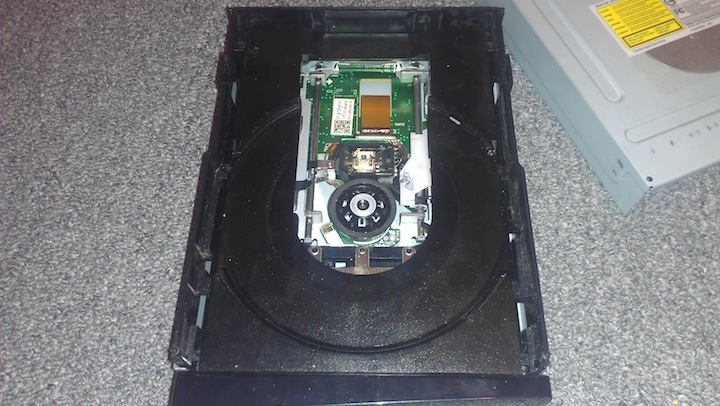 If you power on, and you never see the green debug led flash and the xbox doesn't make the tell-tale fan stuttering sign, chances are the CR isn't attempting to glitch. Verify that you are booting from the DemoN NAND and not the 360 NAND, unless you have removed the EN wire from the coolrunner. If you are still having problems, verify all solder points and try to route the blue (D) wire away from any coils, ground, or power wiring. I had to run mine back over the board towards the center of the CR to avoid interference for the best glitch results. Phase 2 added, along with some basic troubleshooting tips. great work sonic. looks excellent.